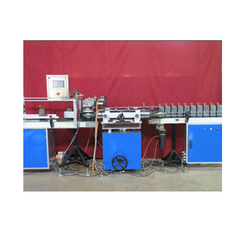 We are a leading Manufacturer of pressure inspection system, single head leak detectors, vacuum inspection system, after seal leak detector and leak test equipment from Mumbai, India. Elegant design Compact & Lightweight. Can detect the micro-leak up to o.1mm thick hole too. Pressure Inspection System offered come designed and developed using latest technology support and has elegant compact lightweight design finish. Further, it has a low power consumption of 50W and is highly accurate, efficient user-friendly in terms of performance. These are suited for accurately detecting the micro-leak or up to o.1mm thick hole too and have HMI digital control panel for the easier working interface. We offer these inspection systems for pressure testing at competitive prices. Single Head Leak Detection offered come designed and developed using latest technology support and provides for efficient working performance as desired and demanded by the customers. Some of its features include providing for highly accurate working support; efficient user-friendly to use; allows detection of the micro-leak or up to o.1mm thick hole; user-friendly and easy to handle HMI digital control panel.Featuring low power consumption of 50W, the precision performance based leak detection systems also come in compact lightweight construction finish that makes them user-friendly to use. Minimum Pressure 4 kg /cm2. Input Power Supply 415 VAC, 50Hz, 16 Amps. Vacuum Inspection System offered come developed using latest technology support and provides air consumption of 1CFM. Auto Manual modes for Working. Indicated speeds can vary according to the speed of Conveyors. User-friendly LCD Touch Screen Last 10 bottle’s data displayed in MMI screen. Rejected with a buzzer to indicate reject the bottle. Data logging possible on request. We offer high quality After Seal Leak Detector at the reasonable price. This detecting device is designed to detect PET and HDPE bottles. 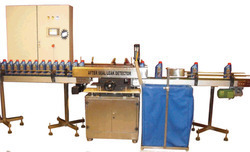 It is used for ensuring the safety during the production process and before the final dispatch of bottled products. It finds its application in pharmaceutical, food, beverage and oil (edible and nonedible) industries. Our leak detecting machine is highly appreciated for its auto detection. The detection parameters can be customized. 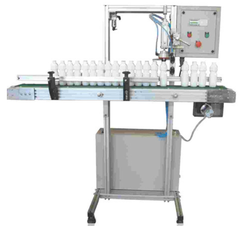 Most ideal for checking of PET, HDPE bottles. 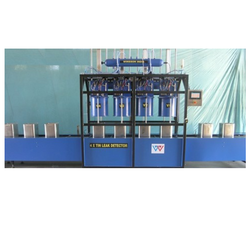 We are manufacturer and exporter of Leak Test Equipment. The unit provides accuracy and high-quality assurance in leak testing. The heart of the unit is the Micro PLC which offers flexible software that allows the machine to be programmed as the customer's needs. The unit incorporates an LCD screen that allows the operator to easily alter the parameters and also shows the vital operating parameters. Looking for Inspection System ?